High quality optical glass elements. 10X high eyepoint widefield eyepieces. 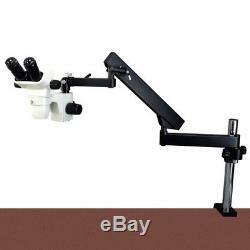 Sturdy articulating arm boom stand provides large working space. 400mm high vertical stand post allows long working distance. 144 LED ring light included. Total magnification: 6.7X - 45X. 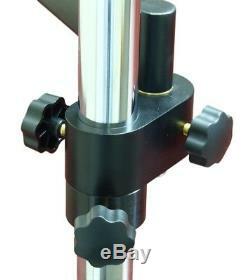 Microscope body - Binocular, 360° rotatable viewing head - 45° inclined ocular tubes - Interpupillary distance adjustable: 54 - 75mm (2-1/8" - 2-15/16") - Inner diameter of ocular tube: 30mm - Mounting size for auxiliary lens: 48mm female thread (M48X0.75). 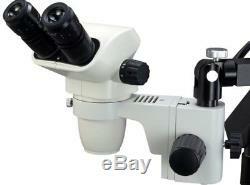 Eyepiece - A pair of high eyepoint widefield WF10X/22, diopter adjustable. Objective - Zoom 0.67X - 4.5X - Zoom ratio 6.7:1. Working distance - 105mm (4-1/8). Field of view - Max. 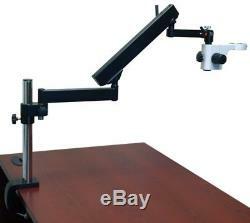 Articulating arm boom stand - Table clamp: Max. Opening 62mm (2.4) - Articulating arm: Spring loaded for easy operating, multi-arm provides more flexibility - 360° rotating horizontally - Radius of working area: Max. 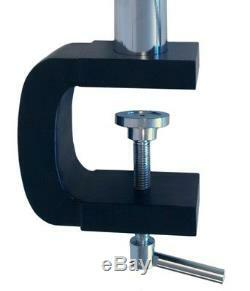 1040mm (41") - Diameter of microscope body holder: 76mm (3") - Focus block: rack and pinion adjustment, range 55mm (2-5/32). Illumination - 144 LED ring light - Variable intensity - Lifetime 100,000 hours - Power: input 90V to 265V AC, output 12V DC - Ring light adapter included. Net weight - 13.7kg (30 lbs 2 oz). 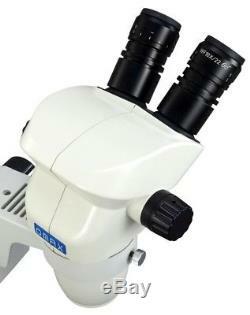 A pair of WF10X/22 eyepieces. 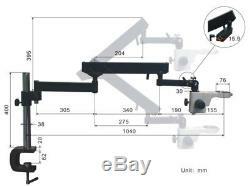 A full set of articulating arm boom stand. 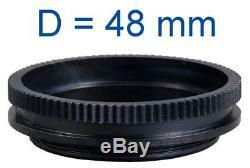 48mm thread ring light adapter. Fluorescent ring lights for illumination. 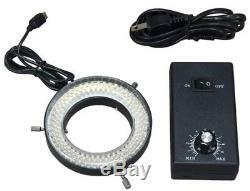 Other LED lights for illumination. 2.0X auxiliary lens for having higher power levels. USB cameras for computer or monitor. The item "OMAX 6.7X-45X Articulating Arm Binocular Stereo Microscope+144 LED Ring Light" is in sale since Monday, August 8, 2016. This item is in the category "Business & Industrial\CNC, Metalworking & Manufacturing\Semiconductor & PCB Manufacturing\Inspection Equipment".